What he calls determined we call “drive for perfection,” and when you’re a jobsite supervisor, that’s going to serve you well. Which is to say Ben will serve you well, making sure your home turns out exactly the way you imagined it. Ben started staining trim for Dietrich Homes shortly after high school and worked for us for more than three years while attending technical college. He then worked for a window and door manufacturer for several years, and returned to Dietrich Homes in 2010 when a love for building homes and meticulous finishing brought him back. Now, with more than a decade of trim carpentry experience under his tool belt, Ben is one of our trusted leaders. 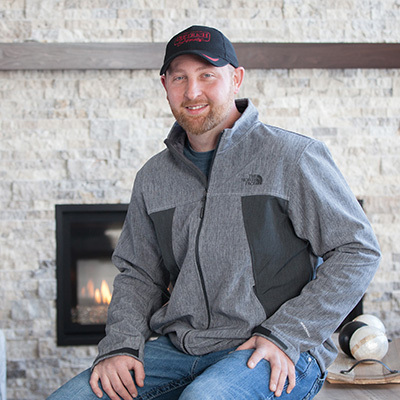 In addition to his drive, Ben takes great pride in his skill as a craftsman and demands a high level of professionalism from the tradespeople on every Dietrich Homes project. And while he might be sparing with words in many situations, he’ll do a great job communicating with you to make sure your home is finished perfectly. Ben’s an exceptional woodworker and an avid hunter and fisherman. After a quiet day in the woods deer hunting or on the lake catching walleyes, you might find him on the porch playing the guitar for his wife, Lynse. Ben also gained valuable experience when doing the construction management for his own home constructed in the fall and winter of 2016. Regardless of what he’s doing – managing a jobsite, communicating with clients, enjoying the outdoors or strumming the six string – we know one thing for sure. Ben always strikes the right chord.